Throughout the seasons of Sewing With Nancy, you’ve seen Nancy demonstrate an array of scarf options. During this two-part series, Favorite Scarves to Sew, Nancy Zieman Productions, LLC selected a few favorite episodes that feature Nancy’s favorite scarf techniques. For a chance to win a copy of the book, Sewing With Nancy’s Favorite Scarves to Sew from Nancy’s Notions, let us know what scarf you’re planning to sew to freshen up your wardrobe. The randomly selected winner of the book and DVD, The Absolute Easiest Way to Sew from Nancy’s Notions is Julie Kill. Her comment is: Any tip on easier sewing for zippers is more than welcome! Zippers have always been the toughest portion of sewing for me! Thank you for offering much-needed help with these issues! Your methods make everything look wonderful, and they make it easy, so anyone can sew! I would love to try the chenille scarf. It would be something really unique! I wear a uniform to work every day. The chenille scarf would dress it up and would not look like every one else. I love the continuous looped scarf. It is a classic design and would look great with many outfits. Thanks for the great giveaway! I like the continuous loop scarf, fun to make and to wear! I always admired Nancy’s graceful scarves. I would love to make several that I watched her create. Especially the infinity scarf. So many possibilities! I’d love to make either a chenille scarf, or an infinity scarf with 2 fabrics. Although it rarely gets cold in metro Phoenix, we do go skiing and snowboarding in northern Arizona. So, these will be used! I am planning a fall infinity scarf in the orange and rust pattern. Love to have your book and thanks so much. I love the spiral scarf and would love to make one. The continuous loop scarf would be a nice addition to my wardrobe. Since it never gets very cold out here in Arizona, the scarf I would like to make is the spiral scarf. I think it would be perfect for a holiday function I need to attend. Infinity and spiral scarf would be so cool with new fall colors. Infinity and spiral are my two favorites. I’ve worn scarves since high school. I could always update an outfit with one. For this fall, I plan to make a two-toned infinity scarf. Infinity scarf 2 colors would be my choice. You should consider writing, in bold, on the outside of your pattern envelopes: Easy step-by-step instructions! Your pattern instructions are the best I have seen, and I have sewn for a long long time! I recommend them highly. The spiral scarf would be my first, of many I’m sure. I want to embroider on a scarf for my Mom who lives in the mid-west where they have very cold winters and a scarf is a neccesity !! I’d make the infinity ring scarf. So pretty. I had forgotten about the Chenille scarf, I think I would like to make one of those for me and who knows maybe a few others on my gift list! I have seen the show on how to make the continuous looped scarf but as of yet have not made one. Maybe this is the year. These would be great gifts. I like Nancy’s favorite: the spiral scarf. 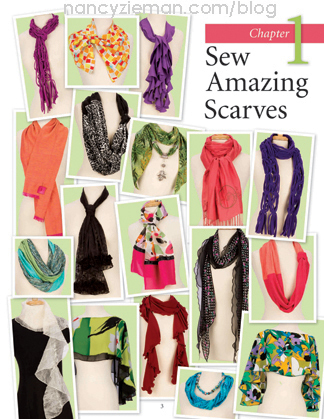 That is a lot of scarves – who knew there are so many kinds! Would love to make the infinity scarf out of gauze to match a top I made. I’d like to make continuous loop scarves for Christmas gifts! I love the Spiral Scarf and the Loop and Tuck Scarf. I’m now inspired to get to work on the scarves I’ve got lined up (yes, I have fabric for 6 of them that are in limbo!) I love re-watching her programs. Thank you sew much for keeping them available. Scarves are such a wonderful way to accessorize. I live in a cold winter climate, so I believe I would love the softness of a chenille scarf first, then tackle a ruffled scarf. Oh, I’m not sure where to start. I have a lot of older, silky squares but find I’d like more long rectangles so that’s my only criteria. This book from Nancy would help me get started. A two toned scarf would be nice to go with any fabric. Thanks for the chance to win. The infinity scarf would be perfect for my new dress. The cowl infinity scarf is flattering so I would sew this one first. However, there are many other designs that I like too. So, I would keep on sewing the scarves…maybe a scarf marathon! SEWWWWWWW many choices for scarf ideas!!! I didn’t know there were so many! I’d love to try the lettuce-Edge-S-Curve scarf–it sounds intriguing. Having watched Sewing With Nancy for years and how often she wore a scarf, I can almost ‘see her’ wearing any one of those pictured. How sweet! The continous loop scarf adds an eye-catching accessory to one’s wardrobe. It is neat looking and makes a statement. The continuous loop scarf is now my favorite, introduced to me years ago by my daughter when she was in college. They became staples in her wardrobe. That book opens up a new world of scarves, though, so I’m sure trying out different styles would be fun for us. Thanks for letting us know about the book! The technique for the chenille scarf is brilliant. How beautiful in fall colors. I love the continuous looped scarf. I think it looks great in many colorways.